The carpeting and carpet installation industry is a massive market in the United States, with carpet accounting for 51% of the total U.S. flooring market - beating out competitors such as wood tile and other types of flooring. Interestingly, the state of Georgia, where we’re headquartered, produces over 45% of the world’s manufactured carpets and rugs. Despite booming business in the industry, however, there are not many safe or efficient ways to install carpet. In fact, most carpeting installed today uses a wet adhesive or glue to secure carpeting to the floor. 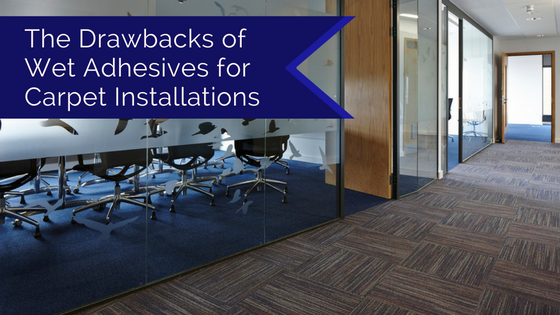 In our experience, we’ve found that this method of carpet installation has many drawbacks. First, and perhaps most importantly, let’s discuss some of the health hazards associated with installing carpet using a wet adhesive. One of the main dangers of using a wet adhesive for carpet installation is something called a volatile organic compound, or VOC for short. A VOC is a natural byproduct of most glues, but is especially prevalent in wet glues. Examples of VOCs found in glues include carbon dioxide, carbonic acid, and ammonium carbonate, as well as many other compounds. During the installation process and for months afterwards, the glue will release these compounds and VOCs into your house or building in the form of gasses. These VOCs have been linked to a number of chronic health issues, including but not limited to: neurological damage, impaired cognitive abilities, and, in some cases, even cancer. These gasses are so dangerous that the carpet industry has something known as an off-gassing period. Off-gassing takes place directly after a carpet is installed, when the area of installation or entire building in which the carpet has been installed has to be vacated for 72 hours to allow the most dangerous gases to vent. Unfortunately for consumers and installers, this off-gassing period is often not enough to remove all VOCs. For obvious reasons, installation times with wet adhesives take longer than dry adhesives. Wet adhesives have very strict cure times that, if not followed, can lead to improper installation and failure in the future. These problems can vary depending on the type of wet adhesive used, but common issues include: cohesive failure, freeze-thaw stability, and balling-up. Also, because of the health hazards, wet adhesives often require a 72-hour off-gassing period. While curing and off-gassing is taking place, the area in which the carpet is being installed is unusable. This can become a financial burden for both the installers and the company or homeowner that is getting the carpet installed. Finally, a wet adhesive is a permanent solution. Once a wet adhesive is used to install a carpet, it can not come up or be removed easily. If for any reason a company or homeowner ever wants to replace their carpet, they will likely find that the wet adhesive is very difficult to remove. A removal process is required to put down new carpet or other flooring. Unfortunately, this process often damages the flooring substrate. This results in additional repair costs and lengthened project completion times. Dry adhesives, like a product we make called Lok-Lift®, can be the ideal solution for your carpet installation. They are free of toxic fumes and VOCs, don’t require long curing or off-gassing times, and are safe for most flooring surfaces. While Lok-Lift is not a fit for every installation, it is worth consideration as an alternative to wet adhesives for flooring installation.